There are many Souls in the higher dimensions who want to assist Earth Humans more directly, to activate Light and Universal Love in the Heart, and many decide to incarnate, to be born on planet Earth in a physical body, in this lower density. The Pleiadian ALAJE is one of these Souls. He is incarnated from the Light-Dimensions of the Pleiadian Star-System, but in a rare way. A part of his Soul is incarnated in a physical body on Earth and the other part stayed in the higher dimensions of Light, in order to be able to act and help in many dimensions. His Pleiadian name is ALAJE. His name has nothing to do with anything on Earth and can not be brought in connection in any way. His name ALAJE is a Pleiadian name with Pleiadian Vibration. 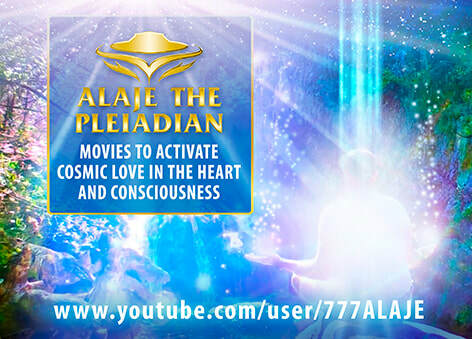 The movies of ALAJE THE PLEIADIAN are providing help and suggestions for everybody who want to live in harmony with the existence and create joy and love in life. His movies are neutral and dissociate themselves from any kind of belief systems, religion-cults, or political views and thus can NOT be brought into connection in any way. Alaje is not responsible for wrong actions or lies of any other third parties and fakes that are being linked to his name or channel. No loving person can be blamed, if evil people are misusing positive suggestions and distort and twist them into something negative. If you want information about Alaje the Pleiadian, activate your LOVE in your heart, and ask the Cosmic Awareness (God), or Light-beings. Don´t ask haters in the internet. If you are listening to hate, arrogance, ego, envy, you can´t find light and truth, and you stay trapped in darkness and hate.